TRENDnet announced its TEW-656BRG ultra portable 3G mobile wireless N router is now available, it should retail for around $99.99. TRENDnet, a best-in-class wired and wireless networking hardware brand, today announces the availability of the ultra portable 3G Mobile Wireless N Router, model TEW-656BRG, which shares a single Internet connection from a compatible Sprint , AT&T , Verizon, or other USB 3G / 3.75G modem, with multiple users. The TEW-656BRG is one of the lightest and smallest 3G routers available; so small that it can slip into any laptop bag unnoticed. It has no battery, and can be powered directly from a laptop's USB port, eliminating the often frustrating search for an electrical outlet while on the go (it also comes with an electrical adapter). 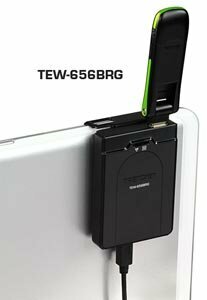 The device also features a built in hanging hook, allowing users to neatly hang the TEW-656BRG on the back of a laptop screen while working. The 3G Mobile Wireless N Router, model TEW-656BRG, is currently shipping to online and retail partners.